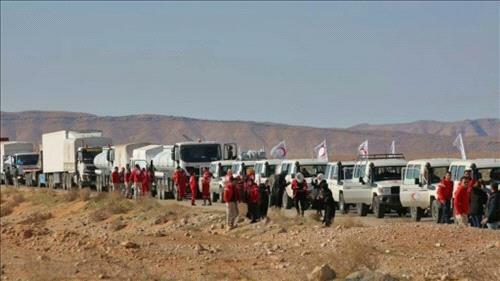 AMMONNEWS - An aid convoy on Wednesday reached displaced Syrians in desperate need of assistance near the Jordanian border, in the first such delivery in three months, the Red Crescent said. The convoy also includes healthcare items and medical supplies to immunise women and children, it said. Wednesday's delivery is the first to reach the camp on the Jordanian border, after a first smaller convoy from Damascus on November 3. Conditions inside the camp have deteriorated, with many inside surviving on just one simple meal a day, often bread and olive oil or yoghurt, according to one resident.